An absolutely gorgeous wavy rim bowl standing on a flared decorated foot. Beautifully decorated both inside and out. Backstamp: Adams Est 1657 Cattle Scenery Ironstone. Crazed with some associated discolouration although this is mainly on the underside of the bowl and the foot and there is a little blue smudging around the rim. A gorgeous hexagonal basket standing on six small feet and with two side handles. On the outside is the lovely floral border pattern with embossed criss-cross decoration. Inside is the floral border with lovely rural scene of horse, cows and donkeys. Backstamp: Adams Est 1653 Cattle Scenery England. A little minor surface scratching inside otherwise excellent condition. Gorgeous bowl beautifully patterned both inside and out. Backstamp: Adams W A & Cattle Scenery Ironstone England. Inside there is surface scratching to the base and a little loss of glaze to the stilt marks, otherwise excellent condition. Fabulous octagonal bowl beautifully patterned both inside and out. Backstamp: Adams Cattle Scenery Ironstone. Excellent condition. Printed in a steely blue this is an absolutely fabulous bowl beautifully patterned both inside and out. Backstamp: Adams Est 1657 Cattle Scenery Ironstone. Light all over crazing with a little surface scratching inside and small area of restoration to the rim otherwise excellent condition. Fabulous octagonal bowl beautifully patterned both inside and out with delightful scene of cows, sheep and a donkey. Backstamp: Adams Cattle Scenery Ironstone. Inside there is some surface scratching and a little bubbling of the glaze to the base and there is some blue smudging here and there, overall excellent condition. Very attractive oval basket with two side handles, beautifully decorated both inside and out with honeycomb moulded relief around the lower half of the basket and a different cartouche each side with bird cartouche inside to the base. Printed in a slightly steely blue. Backstamp: Rd No 623294 This pattern was introduced by William Adams in 1780 being a copy of a Chinese pattern and one of the first of its style produced in English pottery Wm Adams England. A little smudging of the pattern to part of the inside rim and some of the pattern has thin glaze where the blue has a slightly green hue. The solid blue handles have a couple of white areas to them. Overall excellent condition. Fabulous octagonal bowl, beautifully decorated both inside and out. Backstamp: Reg. No. 623294 This pattern was introduced by William Adams in 1780 being a copy of a Chinese pattern and one of the first of its style produced in English pottery. Wm Adams England. Light crazing and there is a discreet firing crack around the top of the foot, where it meets the main body of the bowl. This is an impressive piece, octagonal and standing on an octagonal foot, beautifully decorated both inside and out. Backstamp: Rrd no. 623294. This pattern was introduced by William Adams ..... Wm Adams. Light crazing otherwise excellent condition. This is a delightful piece, beautifully patterned both inside and out. It stands on six small feet, has a gently flared rim and decorative diamond embossed detail to the outside with rope effect handles. Backstamp: Rd No 623294 This pattern was introduced by William Adams ..... Wm Adams England. Inside to the base there is a little loss of glaze to the stilt marks, otherwise excellent condition. This is a delightful piece, beautifully patterned both inside and out. It stands on six small feet, has a gently flared rim and decorative diamond embossed detail to the outside. Backstamp: Rd No 623294 This pattern was introduced by William Adams ..... Wm Adams England. Very attractive with two side handles, beautifully decorated both inside and out with honeycomb moulded relief around the lower half of the basket and a different cartouche each side with bird cartouche inside to the base. Printed in a soft slightly steely blue. Backstamp: Rd No 623294 This pattern was introduced by William Adams in 1780 being a copy of a Chinese pattern and one of the first of its style produced in English pottery Wm Adams. Inside to the base there is a little loss of glaze to the stilt marks, otherwise excellent condition. Fabulous large octagonal bowl with rural pattern of cattle, sheep and a horse either side of the body and a variation of same inside to the base. Backstamp: English Scenic Warranted Staffordshire Adams England. Excellent condition. This is gorgeous! Standing on six small feet, the upper half of the outside has an embossed criss-cross pattern decorated with small flowers. It has light crazing otherwise is in superb condition. With gilt. This is a stunning piece! Hexagonal and standing on six small feet. The outside of the top half of the basket is decorated with an embossed diamond pattern adorned with small printed flower detail. The side handles are gently moulded and highlighted with gilt. Lovely romantic view inside to the base and all in superb condition. Typical blue printed backstamp. A magnificent comport or centrepiece, with generous decorated splay foot and two ornate side handles. 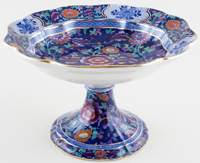 Made by Samuel Alcock & Co of Burslem and decorated in their famous flow blue Oriental design, with gilt decoration to the rims and added deep cobalt and gilt decoration to the side handles. Beautiful deep pearly cobalt glaze, really luscious. There is some crazing to the glaze, a little wear to the gilt and one handle has been off and restuck, otherwise it is in superb condition. Typical blue printed (smudged)cartouche backstamp with Oriental and the initials SA&Co, plus impressed 5X. This is a fine example of Oriental and impressive display piece. Round comport with moulded side handles and on splay foot. Delicately engraved oriental scene printed in soft shades of blue. Luscious. Blue printed backstamp. This is a rarely found piece in Asiatic Pheasants. It has some discolouration around the rims but there is no crazing. Impressed Ashworth and impressed date for October 1883. Such an elegant piece standing on a tall slender stem. No crazing but there are spots of browning in the glaze, here and there. You can see it on the large photograph. It is not as "wonky" as it looks on the thumbnail photograph! Impressed backstamp Ashworth and Real Ironstone China. Chusan was originally a Morley design, which was produced in a number of variants over the years. This is a stately footed bowl with two side handles. It has light all over crazing and the foot has suffered a little damage in manufacture but this has been glazed over and is not that obvious. Overall in excellent condition. 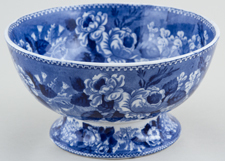 Fabulous footed bowl printed in a dark blue with white floral decoration. A little minor surface scratching inside to the base otherwise excellent condition. Blue printed backstamp Ashworth Bros Hanley. Very attractive comport with two ornate side handles. Backstamp: Lake and impressed 6(?) XO There is a little surface scratching inside and wear to the outer rim but overall fine. A stunning large bowl with side handles and pattern both inside and out. Backstamp: Lake. Light crazing, a little wear and discolouration, a faint star hairline on the outside which does not go through and a couple of manufacturing faults around one handle. Sounds awful, but looks much better, overall a stunning piece. 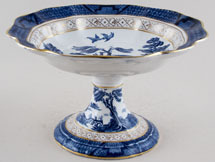 Delightful low comport with wavy rim. Backstamp: Ashworth Bros Hanley England. A little surface scratching and touch of minor wear to the outer rim, overall excellent condition. Made by G L Ashworth & Bros, makers of Masons Ironstone. Blue/black printed outline with hand painted enamel colour decoration. There is a mnor rub to the rim and an under-rim chip has been restuck, otherwise good condition and the colour is bright and clean. Red printed Royal Arms, with impressed Ashworth Real Ironstone China and pattern number B2803 in script. J & MP Bell of Glasgow. Fabulous large footed bowl with side handles, beautifully patterned both inside and out. Backstamp: Italian Lakes J & MP B & Co. There is a little discolouration where the handles join the body and inside some surface scratching and a little discolouration. Overall a stunning piece. Made by J & MP Bell and Co. of Glasgow, Scotland. Small round comport, which may have had a cover originally, with side handles. Glaze is finely crazed, but otherwise fine condition. Blue printed backstamp with cartouche containing Italian Lakes and J&MPB&Co. Made by J & MP Bell and Co. of Glasgow, Scotland. Round comport with side handles, which may have had a cover originally, but is so beautifully patterned that it is equally as attractive on its own. Glaze is finely crazed and there is a small rub to the rim otherwise fine condition. Blue printed backstamp with cartouche containing Italian Lakes and J&MPB&Co. J & MP Bell of Glasgow. 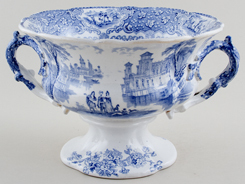 A fabulous large footed bowl beautifully decorated both inside and out with this classical fountain scene. Backstamp: Neuilly J & MPB & Co. Light crazing with just a hint of minor discolouration and some surface scratching inside to the base. Overall a stunning piece. J & MP Bell of Glasgow. This is a fabulous footed bowl. Backstamp Triumphal Car J & M P B & Co. It has light all over crazing with a just little minor discolouration to the foot. The foot also has a very minor firing fault otherwise fine a lovely piece. Beautifully patterned both inside and out. Made by J & MP Bell and Co. of Glasgow, Scotland. Round comport with ornate moulded side handles, which may have had a cover originally, but is so beautifully patterned that it is equally as attractive on its own. Backstamp: Triumphal Car J&MPB & Co. Light all over crazing and there is a tiny hairline and some wear and discolouration to the outer rim. Overall a lovely piece. J & M P Bell of Glasgow. This is a fabulous footed or punch bowl. Backstamp: Triumphal Car J & M P B & Co. There is surface scratching inside to the base otherwise excellent condition. This punch bowl would make a wonderful centrepiece with a diameter of 10.5 ins. Has some light crazing and some scratching to the surface inside the bowl. A stunning bowl completely patterned both inside and out. Standing on a round splayed foot which has moulded decoration around the rim. Bears impressed registration number 206045, which would be for the shape, for 1894. Also impressed Caduceus mark of Bishop & Stonier. The three stilt marks inside to the base have absorbed a little stain otherwise in superb condition. Bone china with gilt. 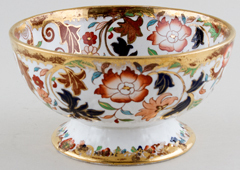 Absolutely gorgeous comport with a fabulous border surrounding the central grape pattern. Backstamp: In script 8729. Excellent condition. This is so so pretty. An oval open weave basket with delicate handles. Externally the basket is decorated with 60 tiny flowers, those around the handle join are particularly ornate. Backstamp: British Scenery Booths Silicon China England. Light all over crazing with a little minor discolouration but this is mainly underneath, a tiny tiny hairline to the rim and inside a small minor blemish. Overall excellent condition and a truly beautiful piece. This is so so pretty. An oval open weave basket with delicate handles and externally decorated with tiny flowers, those around the handle join are particularly ornate with the addition of leaves. Backstamp: Booths Silicon China England Rd No 656925. Light all over crazing and there is a little damage to two of the flowers otherwise excellent condition. With gilt. Fabulous comport with wavy moulded rim decorated in rich bold colours. Backstamp: Booths Silicon China England. Light all over crazing and a little minor wear to the gilt, overall excellent condition. With gilt. Fabulous footed comport printed in rich bold colours. Backstamp: Jacobean, Maple London (the latter probably the retailers). A little crazing and touch of wear to the gilt otherwise excellent condition. With gilt. An absolutely gorgeous basket with fabulous detail of tiny flowers adorning the piercings. Inside the base is decorated with a lovely bird cartouche surrounded by smaller floral ones. Backstamp: Booths Silicon China England Mosaic Panel. Light all over crazing with a tiny tiny chip to one of the flowers, overall excellent condition and an absolute joy! Beautiful large footed fruit bowl or comport with two decorated side handles. Blue printed design with hand painted colour to the flowers and ochre rim. A little light crazing to the glaze, otherwise superb. Blue printed backstamp Booths, crown, Silicon China, Made in England, Netherlands. With gilt. Backstamp: Booths Silicon China England Real Old Willow. Date of manufacture probably 1907-14. Very attractive piece, but it has seen some life! It is crazed and there is some discolouration. A chunk from the bowl has been off, restuck and restored, with further restoration to the rim. The gilt around the rim and the inside of the bowl is worn and there is just a little minor wear to the gilt on the foot. Having said all of that this is a lovely unusual piece and will appeal if you like items that show their age. Provenance: The Entwistle Collection. With gilt. This is fabulous, a low comport on a decorated stem. Backstamp: Booths Silicon China England Real Old Willow. There is a little very minor surface scratching otherwise excellent condition. With gilt. Backstamp: Booths Silicon China Made in England Real Old Willow and black printed Patt No 9072. With gilt. Backstamp: Booths Silicon China England Real Old Willow and in script 9072. Date of manufacture probably 1917-20. An extremely elegant plain rim comport. It is crazed and has a little wear to the gilt otherwise absolutely fine. Provenance: The Entwistle Collection. With gilt. A stunning piece from a dessert service. Beautifully decorated inside and to the stem and foot. Backstamp: Booths Silicon China Made in England. Crazed with a very small blemish inside otherwise excellent condition. With gilt. Fabulous bowl with two side handles and beautifully patterned around the outside. Backstamp: Booths Silicon China Made in England Real Old Willow and in gilt PATT No 9072. Light crazing with just a hint of discolouration inside otherwise excellent condition. With gilt. Backstamp: Booths Silicon China Made in England Real Old Willow. Date of manufacture probably 1935-36. A fabulous bowl standing on a round decorated foot with two ornate side handles. One or two very minor blemishes inside otherwise superb condition. Provenance: The Entwistle Collection. These are spectacular! Open weave baskets, the diamond lattice work decorated at each corner with a delicate little flowers - 36 in total on each basket, plus those decorating the handle join which also have the added decoration of leaves and berries. The pretty Pompadour floral pattern around the foot, inside to the base and around the inner rim. There is just a touch of crazing here and there otherwise these are in magnificent condition. Blue printed backstamp: Booths Silicon China England The Pompadour. This pattern was introduced in 1907. Made by T C Brown-Westhead, Moore & Co. A very attractive shape and unusual pattern printed in a steely flow blue. Excellent condition. There is a blue printed backstamp with the typical shield and garter mark with B B W & M and the pattern name Italie in the garter with Cauldon England above and Cauldon impressed. The backstamp B B W & M suggests that the pattern was introduced during the Bates, Brown-Westhead & Moore period 1859 to 1861, but the addition of Cauldon England suggests a date of manufacture around 1895.